National Brands [in the AVI stable], home to some of the best known South African tea, coffee and creamer brands, set out to take a bite of the instant cappuccino market. But instead of only achieving this, landed up crafting its own category and redefining the cappuccino coffee experience. By utilising local insights, a challenger mentality, inspiration from other categories and a lot of creativity, the local FMCG player created a brand experience that strongly connects with consumers and ultimately turned a big business challenge into a long-term win. The coffee space has been booming for the last few years as café and coffee culture takes hold within South African life. South Africans are no longer just looking for a quick cup of coffee on-the-go, but they are looking to enjoy a quiet moment to themselves whilst indulging in their favourite, creamy, hot beverage. Because of this, supermarket sales of instant cappuccino sachets has become the fastest growing coffee sub-segments, worth R500-million, as delighting in a cappuccino in the comfort of one’s home or on-the-go continues to gain mass appeal. Despite growing demand for cappuccino sachets, the market was already dominated by a global coffee player with loyal followers. The usual strategy for brands who are late to market is to match taste, offer similar brand benefits, but at a cheaper price than the market leader with the intention of switching consumers with a promise of greater value. However, case studies show that this approach very rarely works as consumers perceive these offerings as inferior and even advertising to change attitudes is not possible as marketing funds have already been allocated to discount the price. So AVI decided to create a brand that breaks from convention and is difficult for other brands to replicate or compete with. In addition, the aim was to attract new users and switch consumers who will ultimately pay a premium for their branded experience. Flavoured cappuccinos were exploding on a global level, but this was not the case in South Africa and AVI needed to understand if this was a market worth tapping into. Many South Africans liked the idea of flavoured cappuccinos, but felt that it was inaccessible due to the price tag associated with it. With in-depth market research, AVI gained invaluable insight into the South African coffee culture which revealed that consumers typically enjoy their coffee sweet, creamy and milky with the average South African enjoying their coffee with two and a half sugars, milk and coffee creamer. With no ready- made solution catering to this profile, AVI saw the gap as a major opportunity to offer an all-encompassing product that met the sweet, creamy, milky, flavourful, and convenient criteria at an affordable price. 2. Building a brand platform on emotional connections and consumer insights. While the leading cappuccino brand was focused on owning the category conventions of an early morning energy fix and a coffee shop experience in an instant, AVI wanted to connect with consumers on an emotional level. The brand based its proposition on a key consumer insight which found that stressed consumers were looking for small indulgences and treats that offered comfort and a little escape from the daily grind. 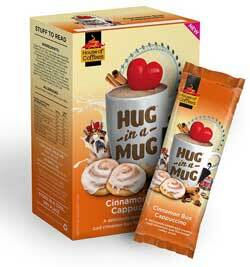 It was through this insight that brand name, Hug in a Mug was born. By breaking convention, and by borrowing cues from these categories such as appetite appeal, colourful design and advertising that creates worlds of joy and happiness, AVI crafted a brand that is endearing, charming and whimsical and positioned more like a liquid, indulgent snack than a traditional coffee. 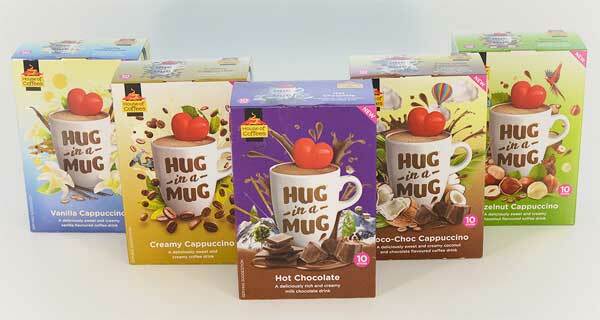 Every element of the Hug in a Mug brand conveyed the message of enjoyment and escapism and was designed to garner attention, stimulate the senses and translate into “try me, buy me”, ultimately getting the consumers’ attention through impact, and ensuring impact converts to trial. The first point of contact for the grocery shopper is the packaging design. The brightly-coloured pack, which includes wild characters, appealing ingredients and a brand logo of a steaming cappuccino with a heart in it reflects the brands strategy. The range instantly stands apart from the sea of brown, heritage coffee brands in the shopping aisle. This is extended into the point of sale and stands in-store that feature the same unconventional look and feel that entices impulse purchasing and trial of the product in-store. Escapism and indulgence is followed through to Hug in a Mugs’ tone of voice, which is poetic and connects with consumers on an emotional level. On the digital front, Hug in a Mug echoed the same “take a break” sentiment and created campaigns that encouraged consumers to take 5 minute breathers from their daily tasks. Flavour innovation saw the launch of the Toasted Marshmallow flavour in 2016, and the new flavour, Cinnamon Bun, in 2017. 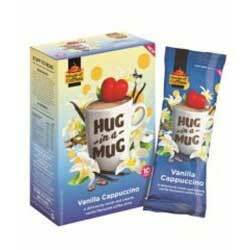 Since its inception in 2015, Hug in a Mug has gained over 22% market share and sales in excess of R100-million annually. The brand attracted new, younger consumers and grew the instant cappuccino category by over 30%. “There is a reason they say that marketing people have the shortest lifespan in a business! “But jokes asides, the managing board bought in over two key points – it was all validated on real insights and the product taste and quality was an ‘absolute winner’ and completely unique in the market. “But it’s easy to doubt yourself, even getting to the name – which seems so simple – took months and different agencies working on it.